Nelson was collected on the 7th may 2012. His previous owners new partner had been feeding Nelson cakes and puddings until he was barely able to walk. He was in kidney and liver failure and had been chewing on his leg joints from the pain. I took him immediately to the vets and asked for advice on how best to help him lose weight without starving him and to have his urine tested for organ function. 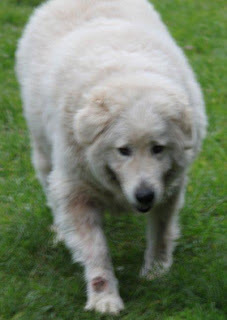 He has been with me (VIC Maremma rescue) now for 2 months and last week when I took him to be weighed he weighed a much much healthier 58kilos and is now known as Nelson the dancing man as he dances every time he sees me. I have now found him a new home which he heads off to on Sunday 15th with a family who has 2 other Maremma and he will have some poultry and calves to look after as well as a family to love him who understands they must continue with his diet. His diet has consisted of 2-3 grated carrots with a ½ small can of mixed veg, meat and rice dog food once a day. 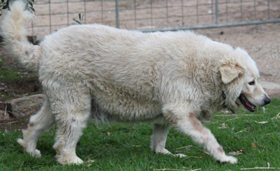 He has been fantastic with the diet and has not scavenged for food throughout the day and loves to go for walks around the farm with my family and other dogs.